I guess you had many exciting games with your family and friends. In the peaceful environment, you had a great time. That's such a simple life! But did you ever have a child coming around in the middle of play to start messing up? Did you have to deal with a little board game destroyer? How would you handle a situation when your 2-year-old little one is trying to join the game and play with you? I used to go through this a year ago and soon it's going to happen again when Sara is two! When I played games with my wife and the older children, the 2-year-old Bartlomiej was doing everything to join us! Of course, you can imagine that saying NO would lead me to a battle which I was not going to win! But there are ways to let him à la join. The goal is to help your little one to be part of your play without disturbing the actual game. And you want to be sure that your child won't be bossing you and vice-versa. If you give him some attention from time to time, he or she should be more than happy. Because of the choking hazard give your children only safe and big enough elements, please. Every time you child want to join, let him sit down at the table and give him some of your additional elements you saved for this occasion. The child will feel that he is part of the game and it's going to be an excellent introduction to board games. He can play with those elements how he wishes. - Give your child some attention. Without it, he will be bored after a short while! - Congratulate him a good play. Talking with your kid will show him your interest in what he is doing and prove him that's meaningful and good. - Interact in his play! From time to time move his meeple, put tokens on the board. - Don't give him all things from the box at once. Try to rotate those elements so that he can have something new all the time. That will keep him busy for longer. You can do it all while playing your "serious" adult game. You might need to train a bit your multitasking skill, but it's possible and definitely worth it! If you don't keep you child engaged, soon he will be interested in your game again! I found the whole method quite useful, and I'm very curious how that works with your little ones! Maybe you got any other tips you'd like to share with us? 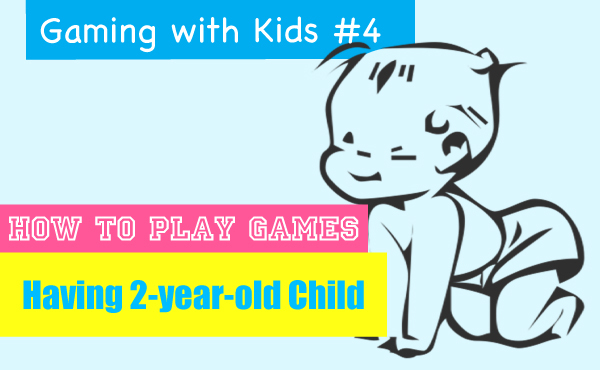 If you enjoyed my post, you could like my other articles about Gaming with Kids!